One of the first concerns facing businesses —and many consumers —when choosing a new mobile platform is how it will enable them to get work done. To answer the question, AppleInsider went hands-on to compare the top three iOS contenders: Apple's iWork, Microsoft's Office 365, and Google Docs. While each suite's ancillary services —like hosted e-mail and file storage —differ slightly, all three platforms offer some variation on the age-old trio of word processing, spreadsheets, and presentations. For the purposes of this review, we will look only at those features available on iOS —iWork for iCloud's web-based document editing, for instance, is not included. Apple's iWork suite counts three native apps, iOS versions of the company's Pages word processor, Numbers spreadsheet, and Keynote presentation creation application. Each app is free with the purchase of a new iOS device, but users who need to get up and running on their current handset or tablet will still need to purchase them in the App Store for $9.99 each. Microsoft Office 365 is available from the software giant on a subscription basis, with varying costs and differing packages for home users and business users. We chose the $12.50-per-month Office 365 Small Business Premium plan, which is the least-costly option that grants access to the company's Office Mobile for iOS app. 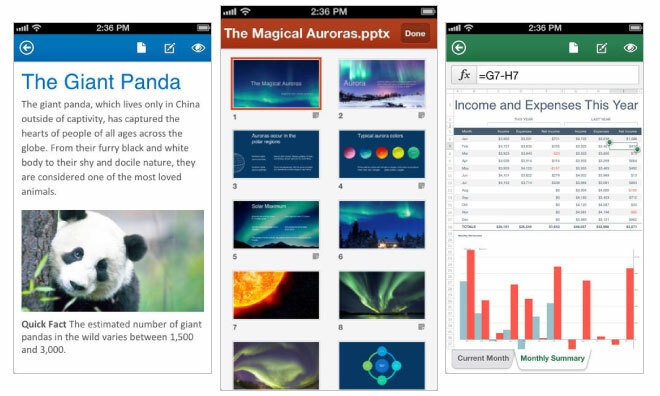 Unlike Apple's native app strategy, Microsoft has chosen to integrate its entire suite in to a single application, Office Mobile, though that strategy may soon change as rumors indicate an iOS version of the company's Word, Excel, and Powerpoint applications is on the way. Google Docs is famously free for anyone with a Google account —which is now a large swath of internet users —though we chose to work with the company's Google Apps for Business platform at $50-per-user-per-year. Upgrading to Google Apps for Business does not add any additional features within the scope of this review, and the accompanying Google Drive iOS app is available free of charge to all users. Apple's suite is, without question, the most feature-rich experience available on iOS. The ongoing "Back to the Mac" iOS/OS X strategy combined with the company's renewed push into the enterprise and education markets have made the iOS versions of longtime tentpole applications first-class citizens, so much so that many users of their desktop counterparts feel iOS's influence has grown too strong. What frustrates customers on the desktop, however, is at the same time a boon for mobile users. Document creation is easy, featuring most of the same predefined templates as Apple's desktop applications, while retaining a significant degree of control over style and layout. Editing existing documents —including collaboration features like Apple's implementation of change tracking and commenting —works smoothly, with synchronization between devices happening quickly in the background whether on Wi-Fi or mobile data. Pages, Keynote, and Numbers on iOS are as feature-rich as their desktop counterparts. Pages can import and export Microsoft Word documents, though some formatting is often lost in the transmogrification. We also found some small, yet annoying, issues with the new Pages user interface, such as a situation where on-screen controls for swapping images disappeared if the image was enlarged such that its edges moved off-screen. Because users can't pan around the Pages canvas on iOS, fixing this means resizing the images until the controls return, then enlarging it yet again after making changes. 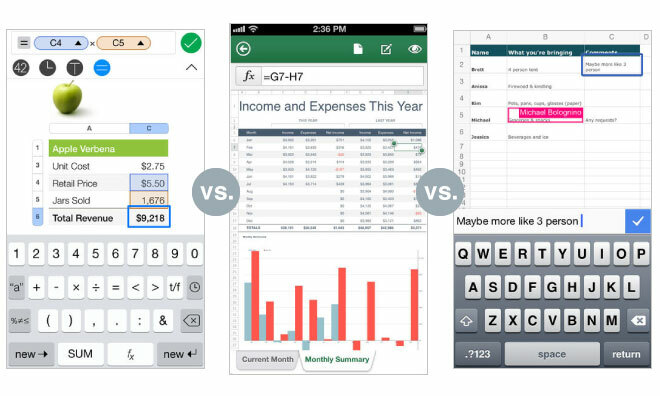 Numbers is perhaps the most impressive iWork for iOS app in the context of power versus touchability. Apple has packed an admirable amount of the desktop application's functionality into the iOS app—ï¿½formula creation is particularly fine, as Cupertino has taken full advantage of iOS's ability to customize the keyboard to each specific purpose. Like its document and presentation siblings, Numbers can also import and export Microsoft Office-formatted documents. Keynote may be the least-used of the three applications over the course of a typical workday, but it has seemingly received the same amount of attention from the iWork for iOS team at Apple as its more high-profile brethren. Creating a simple presentation revealed no areas that we found lacking, and unlike Pages, Keynote did not allow us to enlarge photos so much that controls disappeared offscreen. 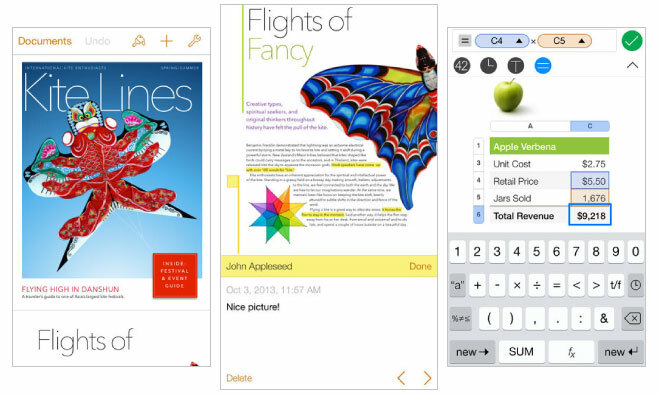 Apple's recent focus on content sharing has carried over to iWork for iOS, and moving documents between an iPhone 5 and iPad Air both through iCloud and via the company's Bluetooth-based AirDrop technology worked well. Microsoft's Office 365 is widely viewed as the company's response to the threat posed by the growing number of business that are choosing Google's web-based productivity applications over Microsoft's desktop software, and it shows. Microsoft's Office Mobile app is currently only available for iPhone, though the company does promise an iPad version is in the works. After signing in to Office Mobile with a valid organizational Office 365 account —which, in our testing, took nearly a full day to become active for one account but less than one hour for another —users can choose any Office document in their SkyDrive account to view or edit. The app is well designed, striking a nice balance between Apple's iOS 7 and Microsoft's Metro, but functionality is severely limited in comparison to its competition. Office Mobile is fine for small changes, but falls down on creation. Office Mobile's Word implementation offers only basic formatting options. Text size can be changed and made bold, italicized, or struck through, while letter and highlight colors can also be applied in one of three pre-selected colors. Fonts and images cannot be swapped out, and we often experienced trouble selecting text for formatting. Excel fares much better in its mobile incarnation. The touch-based interface for basic spreadsheet functions appears to have been thoughtfully considered, and most of Excel's advanced formula functionality has made the transition. We did miss Numbers's customized formula keyboard, however, and the included charting functionality is rudimentary. PowerPoint, unfortunately, seems to take its cues from Word rather than Excel. 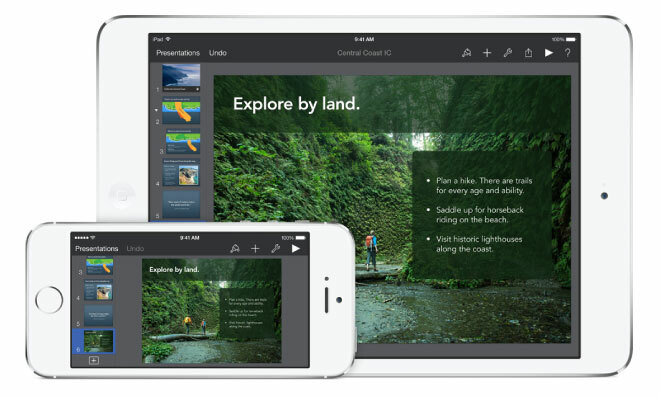 Users cannot create a new PowerPoint document in the Office Mobile app, and editing is restricted to changing text—ï¿½though no formatting options are available—ï¿½rearranging slides and adding presentation notes. Google Docs exists in an uncanny valley between native and web applications, and not just on iOS—ï¿½Google's in-browser strategy extends across its entire platform. 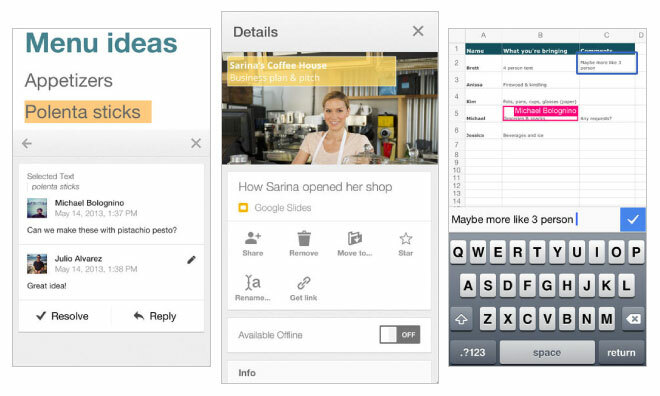 On iOS, the company makes Docs available through its free Google Drive application, which matches Google's other iOS properties with a Google Now-style user interface. Like Microsoft's solution, Google Drive is the single native point of interaction for all of Google's productivity applications. The company has recently updated its entire iOS suite with single sign-on functionality, a convenient time-saving feature, especially for users with Google's two-factor authentication enabled. Google Docs is ubiquitous, but Google Drive for iOS is flawed. Word processing options are more advanced than those offered by Microsoft's Office Mobile but still fall far short of what Apple makes available in Pages. Users can swap fonts, change font size, and edit text and background colors in addition to standard bolding, italicizing, and underlining. Adding images is also not supported in the mobile version. Spreadsheet editing is similarly simple, with basic options available in a spartan user interface. Creating formulas requires typing them in longhand, without the benefit of Numbers's custom keyboard or Excel's formula dictionary. Charting is nonexistent in the mobile application. Presentations are a read-only affair in Google Drive for iOS. Users cannot make any changes, or even add presentation notes. Reflecting Google's mastery of online services, sharing and synchronization work very well. Changes are reflected very quickly between devices, and because of its implementation as part of Google Drive, documents can easily be shared between users without a direct connection between devices. We also appreciated the granular sharing permissions, which allow the document owner to grant view-only, comment-only, or editing permissions to other users. Unless users are in an organization that has standardized on Microsoft Office 365 or Google Apps for Business, there is little reason for iOS device owners to use anything other than Apple's first-party tools. Pages, Numbers, and Keynote are every bit as fast, stable, and feature-rich as their desktop counterparts and are a steal even for the small set of users who will need to pay to acquire them. Microsoft and Google's solutions seem to exist solely to quell the heartburn brought on corporate IT departments by anxious executives who use iOS devices but need a way to make simple changes to documents on the fly. If we were forced to choose one of the offerings from Mountain View or Redmond, we would pick Google Docs and the Google Drive app based solely on Docs's ubiquity among internet users. Tablets and smartphones may not yet be able to completely replace desktop and laptop computers for business users, but Apple's impressive effort with iWork for iOS has closed the gap significantly.